Are all vending machines the same? In short, no. A lengthier answer would be there are different types of technology, products, and service available depending on the company behind the machine itself. An easier way to illustrate the differences a Bernick’s vending machine has over others is to list them out. Here are six ways we differentiate our vending line of business. We offer more beverage categories, period. Aside from classic soda brands and consumer favorites, we're able to offer our vending customers a wide range of options including water (our talented crew even modified a vending solution for LIFEWTR - talk about innovative), non-carbonated juices and healthy options, bottled coffee, hot coffee, energy drinks, protein-based drinks ... the list goes on. See a full list of brands here. Community is a cornerstone of our business, and it matters in vending because we're committed to making the communities we serve better. 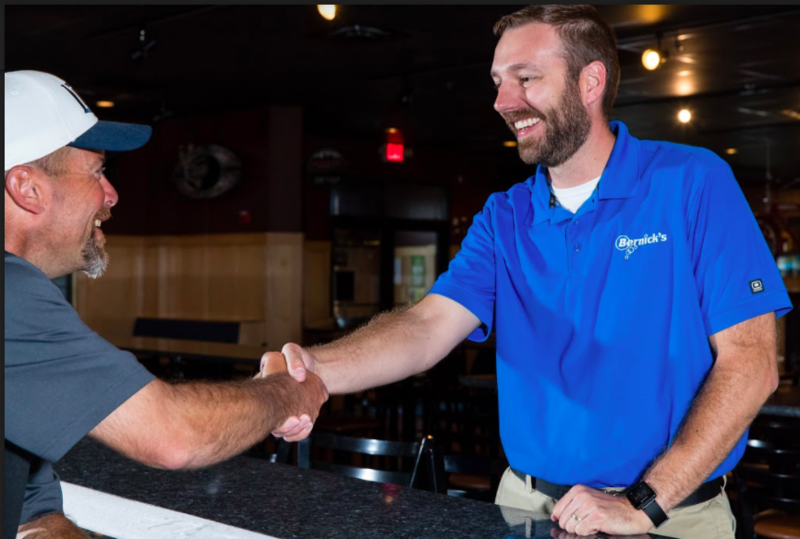 Whether that's through granting easier access to healthy options for businesses and schools to supporting the charitable or philanthropic initiatives our customers have, Bernick's places a big emphasis on connecting and caring. Service is an easy thing to say you do well, no matter the industry you're in. But in order to say the service you deliver is first class, it actually has to be true. As a family-run business whose seen over 10 decades tick by, we're confident in the level of support and dedication we bring to our clients and their businesses, year after year. Referrals and word of mouth in our industry are gold and we wouldn't be entering our 102nd year in business if we didn't live up to our own standard of service. Our business model may revolve around the food and beverage category, but where we take it from there reaches a lot of different spaces, niches, and unique opportunities. There isn't a single account that's like the next. Each of our customers has their own particular set of nuances and challenges. Our team's responsibility is to meet those people where they need to be met in order to be the best option for service. It requires nimbleness and the fortitude to adapt to the situation at hand. Bernick's is able to offer flexibility and fluidity in vending services, as well as across our entire business. I'm adding creative to this list but not for reasons you might expect. Creativity isn't relegated to our marketing and design teams, areas that typically demand creativity as a prerequisite for anyone involved. Creativity, as defined by dictionary.com, is "the ability to transcend traditional ideas, rules, patterns, relationships, or the like, and to create meaningful new ideas, forms, methods, interpretations, etc." That particular adaptation of the word says nothing about creativity being exclusive to art. Our vending specialists and service team apply passion and expertise to their roles daily, challenging status quo and offering customers new ways to regard timeless topics like soda and a bag of chips. With consumer trends changing our industry's landscape as rapid as they do, it's imperative to stay just ahead of the curve anticipating how to better serve an ever-evolving space. Installation of a Bernick's vending machine doesn't mean the end of our relationship, it's just the beginning. We strive to lead the pack on innovation by offering technology and products in vending that allow customers to better serve their communities.